Starting in April 2019, local transit will be significantly disrupted when the L train shuts down for a 15-month renovation. 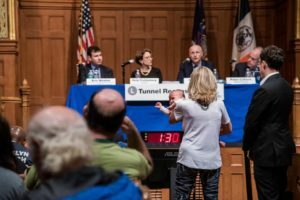 On Monday evening, local residents had the chance to air grievances with local officials at an East Village town hall. The event took place at Middle Collegiate Church on Second Avenue. Notable attendees included Manhattan Borough President Gale Brewer, Brooklyn Borough President Eric Adams and New York City Transit President Andy Byford. One local resident, Georgette Fleischer, attended the town hall with her 4-month-old daughter Augusta. The two live on Cleveland Place, along a planned route where extra city buses will run to serve commuters displaced from their usual subway routes. According to Byford, the L Train carries 400,000 passengers every day; 225,000 of whom use the section of the line slated to close for renovations. Aside from the addition of new bus routes, alternatives for displaced riders will include a ferry between Williamsburg and 14th Street, improved bike lanes, changes to traffic patterns and permanent station improvements on nearby subway lines. To accommodate increased bus traffic, the Williamsburg Bridge will implement three-person high-occupancy vehicle lanes to increase efficiency and reduce traffic, according to Department of Transportation Commissioner Polly Trottenberg. “You will see a tremendous drop in single-passenger vehicles,” Trottenberg said. Many locals expressed concerns about vehicle emissions and asked officials to implement electric and hybrid buses during the shutdown. The MTA plans to incorporate five electric and 10 hybrids in April, and phase in more as the project progresses, according to department officials attending the town hall. Fleischer was dissatisfied with the city’s response to these emissions concerns. Officials took feedback from local residents. One resident, concerned with increased traffic in school zones on 15th Street, suggested the city plan an alternative bus route. As part of the renovations, the L train will receive long-overdue upgrades, including signal and efficiency improvements. According to Byford, the line has been in need of renovations since Hurricane Sandy in 2012, when flooding significantly damaged the line’s infrastructure. To better safeguard for future natural disasters, the renovations will add new mechanisms that will allow entrances and air vents to shut in advance of a emergency. “We’ve just got to rip the bandaid off and get it done,” Byford said. 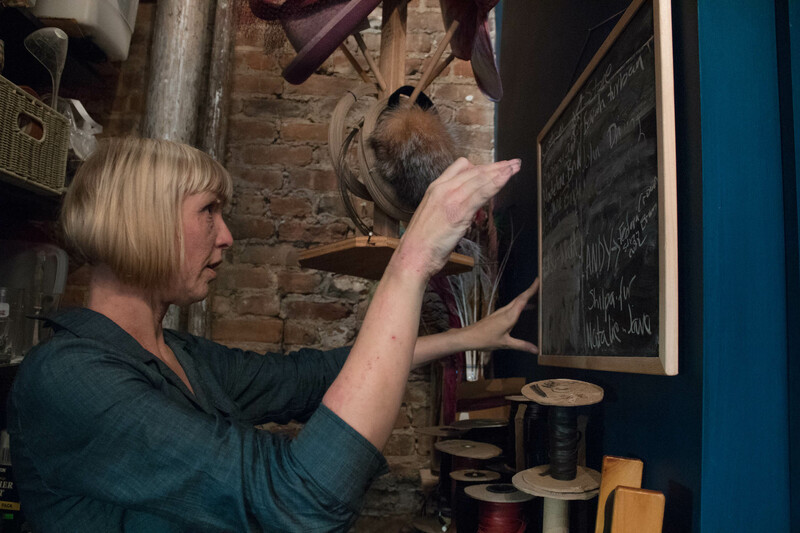 British milliner Julia Knox looks at her to-do list on Sunday, October 15. 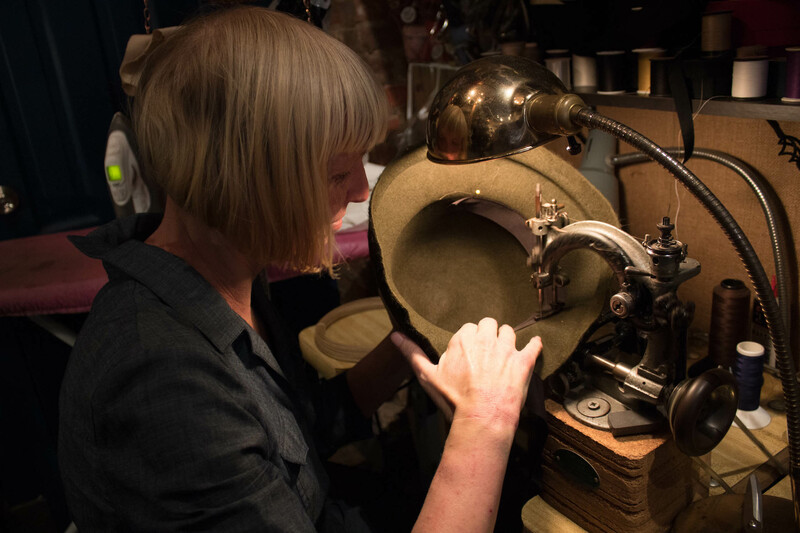 The hat maker owns and operates East Village Hats on East Seventh and First Avenue, where she handmakes hats for women and men on premises. Customers can pick up a pre-made hat or have one custom made. “About 40 percent of customers will get them custom,” Knox said. At East Village Hats, headwear from straw hats to fascinators (or headpieces) to felt fedoras line the walls and the shelves. Knox, who was trained in millinery at the Fashion Institute of Technology, makes most of the hats in the store. She prefers to make casual hats, instead of the fancier statement pieces popular in her home country of England. Knox sews in a ribbon to what will become a felt porkpie hat using a sewing machine from the late 1800s. Felt is Knox’s favorite material to work with due to its versatility and flexibility. “Felt is really easy to work with, it’s really sculptural, it holds its shape, whereas straw is more fragile, you’ve got limits,” Knox said. 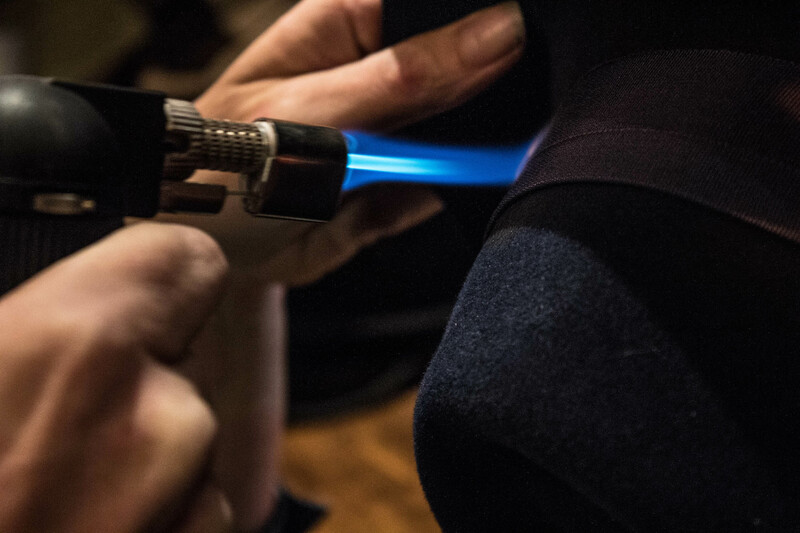 Knox takes a blowtorch to a felt fedora in order to create a distressed look that she says is in fashion. The heat creates a light discoloration to the dark blue felt and ribbon, making it look as if the material was bleached. 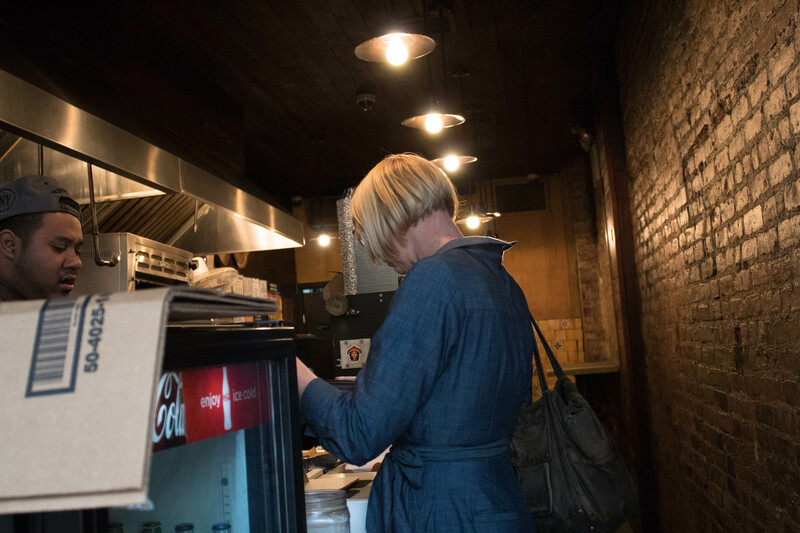 After working for a few hours, Knox stops at nearby taqueria for a burrito. 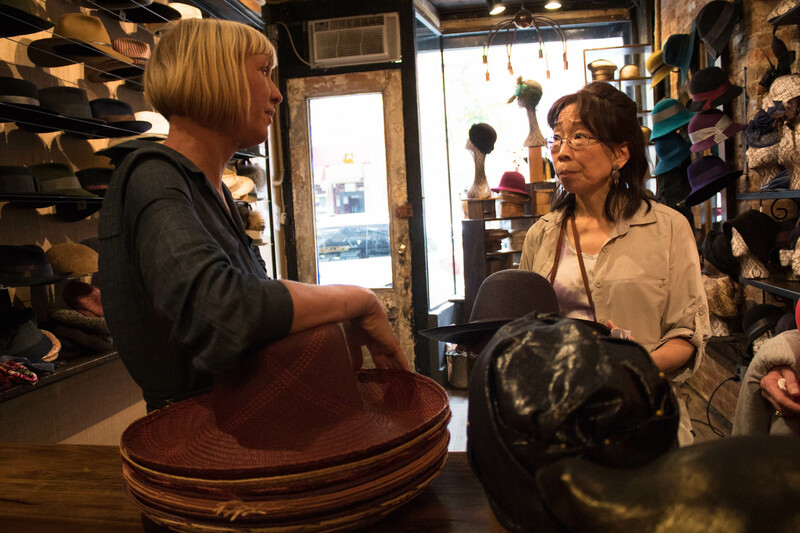 East Village Hats, which was known as Barbara Feinman Millinery before Knox took over and renamed and relocated the shop just down the street, has been an East Village staple since 1998. Leaning on a stack of Panama straw hats, Knox talks to a customer about the merits and history of Panamanian straw. Throughout the day, a steady stream of people wander in, attracted to the hats in the window, and wander out without buying anything. But Knox welcomes regulars with open arms as well, offering up hats she thinks they’d like and chatting easily.